Turned Edge Case Made Binders are a type of product that has the edges ‘turned’ to provide the appearance of a hard bound book. This is usually a ring binder or folder, allowing for easy document storage and removal. They feature glue smooth edges, which also give the appearance of a hand crafted book. For this reason, they are also known as casemade binders. These products are also identified by the variety of cover materials that can be used on them. If turned edge case made binders are your requirement, we at Ad Industries can provide you with a solution. At Ad Industries, we provide many types of custom turned edge binders cases and cover materials. Whether you are looking for something simple and elegant, or something bright, colorful, and eye catching, you can find the best solution in our collection. Cover materials include latex saturated paper, leather, bonded leather, linen cloth, printed film laminated paper, and supported vinyl and imitation leather. Our turned edge case made binders can be handmade or machine made. 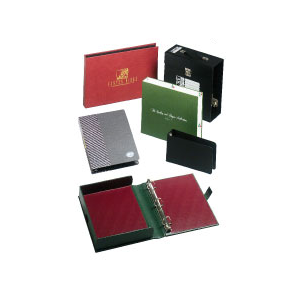 Our case made binders are manufactured using multiple high speed case makers. We have the capabilities to provide more than 1,000 binders per hour. Adhesive Binding: These cases can be produced with various types of adhesives including single pass, hot melt, and P.U.R. Sewn Cases: Sewing lines in the case makers allow for different types of binder cases including center, side, 3 piece, thin book, and saddle stitch. Leather Bound: This option is for customers who enjoy the classic leather book appearance. It includes a hub spine, stain edge, cow hide leather, and pig skin gild. Reese Case: This option includes providing flexibility to the binder; similar to soft bound books. Moiré End Sheets: We provide silk moiré with paper backing for protection of the inside ends and edges of the binder. So, whether your requirement calls for a very detailed, elaborately embossed cover, or a very basic, old blue canvas, which was produced in bulk by automated machines, Ad Industries can provide it for you. Our turned edge case made binders are extensively used with various products including books, magazines, registers, computer games, manuals, guide books, and oblong books. Our other options include the addition of ribbon markers, leather corners, and hub decoration. We provide all these options at cost-effective prices. Contact us to know more.